The topic for week 22 of Dear Data Two was our past. 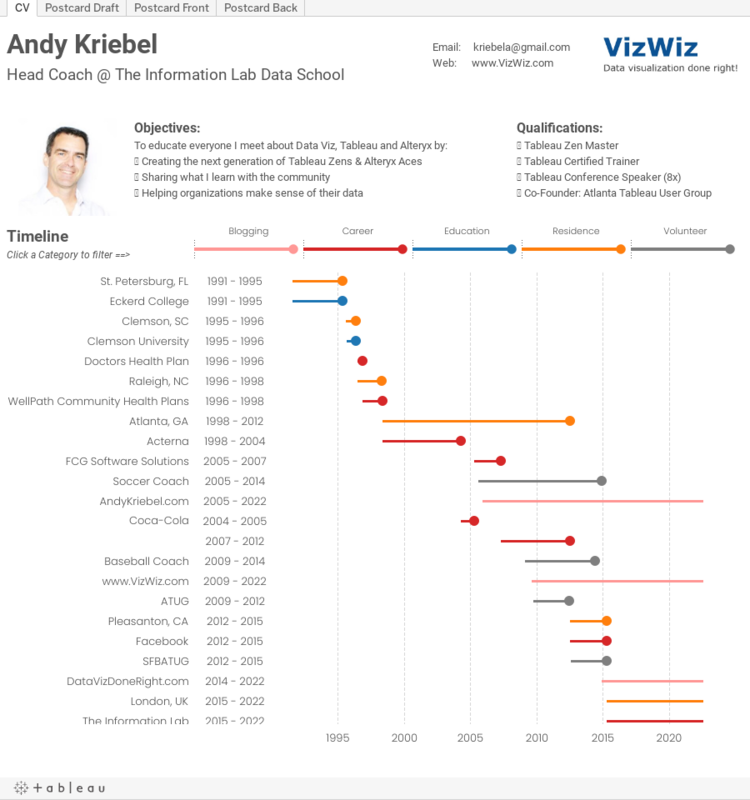 I immediately knew what I wanted to create in Tableau, and that was a visual resume (which you can view here). 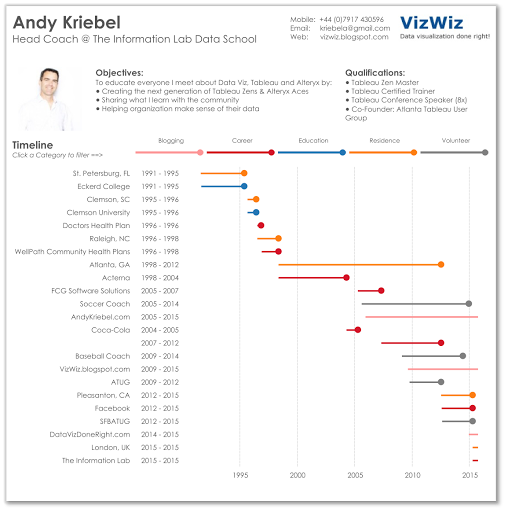 The inspiration for the resume comes from Ben Jones, who showed me his resume built in Tableau a couple years ago before he started working at Tableau. From there, I started working on a couple of different draft versions of my postcard for Jeffrey. I thought I had settled on one and I showed it to my wife. When I asked for her impressions, she thought it was strange how I had stuff going left and right; she thought left looked negative and right positive, so in the final version I incorporated her feedback. From there, I simply plugged all of the dates into Tableau, categorized them, and built the resume in Tableau. And then I suspect a calculated Duration as well so you could get the gantt chart lengths. Just curious if you also included a record count as part of each field? I could see using the types to do some interesting viz work on how much time spent in each vocation. 2. To get the endpoints for the lollipops - I know I need a calculated field - am I doing that with duration? Matt, have you downloaded the workbook? It's all right there for you to see how I built it. Hey Andy, where can I download your workbook for this resume format? Click on the picture. That will bring up the Tableau workbook. Hit the download button.